DE1 was the first Altera based board I bought, and I was very pleasantly surprised by the build quality. 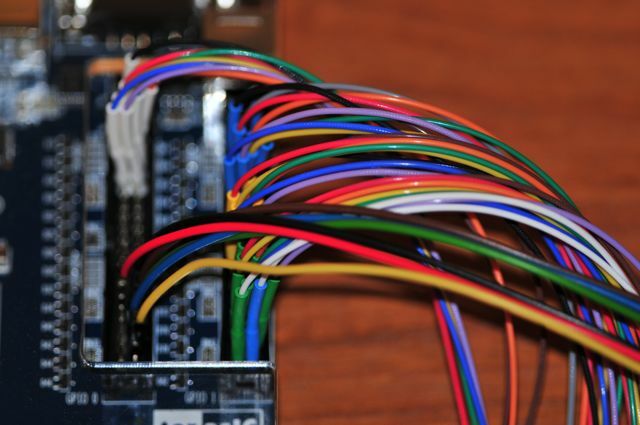 The board has just about any peripheral on it that you would want – static ram, dynamic ram, flash, 7-segment displays, leds, switches, buttons, RS232 DB9, VGA, PS2, sound, sd card, SMA… and expansion ports too, obviously. The only minor drawback is that the FPGA is aging a bit – it’s only a Cyclone-II. Do you even know the difference? Because the board is so versatile, I’ve used it a lot for verification in hardware. And also for debugging in hardware – hook up a logic analyzer to the expansion ports, and try to figure out what is going on – that kind of debugging. The FPGA is big enough to hold all of the PDP11 models, with room to spare. Being an older type of design, it may have some more trouble to keep up with the higher clock speeds – I mostly have the cpu itself at 5Mhz on this board, the newer Altera boards tend to run at 10Mhz. But that may also be due to an error I’m making somewhere.